*Most people don’t know that this is not the official United States Post Office (USPS) credo. The “gloom of night” bit really ought to be a clue. The short version of the origin of this unofficial motto is that it is a translation from an old writing describing ancient Persian mounted couriers, for which this motto makes a kind of sense. I’ve been trying to think of some more things to draw as sketch cards lately. I haven’t drawn any since my comic convention appearance back in December. I like the small canvas and I like that I can make a bunch of them and they are easy to carry around and show to people. But I also feel somehow like I’m wasting them if I just draw random things. I need to get over that, and just draw random things. Sometimes the random things turn out the best, even with my apprehension to do them in the first place. I think it turned out pretty well, with my minimalist approach. 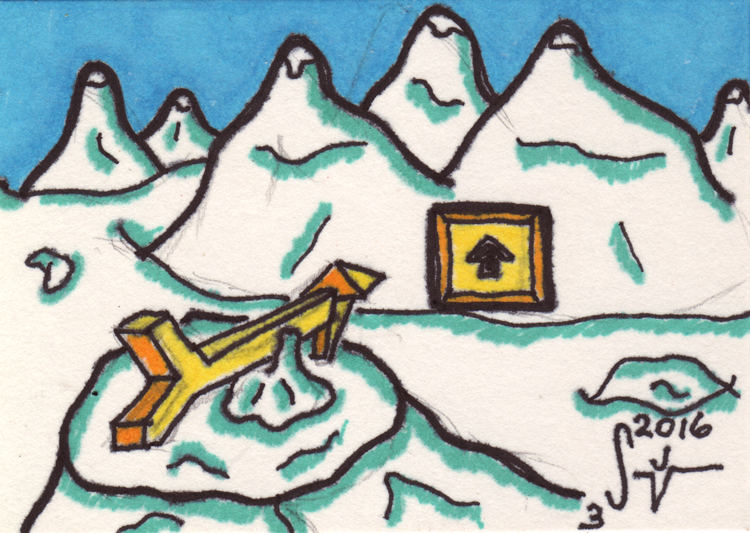 It’s another thing the sketch cards are good for.. because drawing this on a larger scale would mean you really need to put more detail into it or it would just look mostly blank because of all the white snow you want to imply is there in the Arctic… so the sketch card is really the right size to draw something like this. As always, let me know what you think and remember, if you’d like an original commission by me or would like to hire me as an Illustrator, please use the Contact page and let me know as much as you can about your request.